Thanks for your interest in the Wood School Bike Bus, a bike to school program in the Spring and Fall. 3 Bring the completed permissions slip with you to the Bike Bus! We meet Friday mornings between 8-8:15 am on the Phoenix Bike Path at the corner of South St. and Pleasant St., and leave for the school by 8:20. The program is open to all Wood School students. Grades K-2 must ride with a parent and will be dismissed to the parent at the end of the day. Grades 3-5 can be dropped off and picked up at the corner of South and Pleasant streets. Parents are welcome to ride along with any age! If the weather is lousy, check our Facebook page to see if we’ve cancelled. – Listen to and follow instructions from our ride leaders. – Ride for approximately 1.5 miles. – Stop in a controlled manner, sometimes quickly. 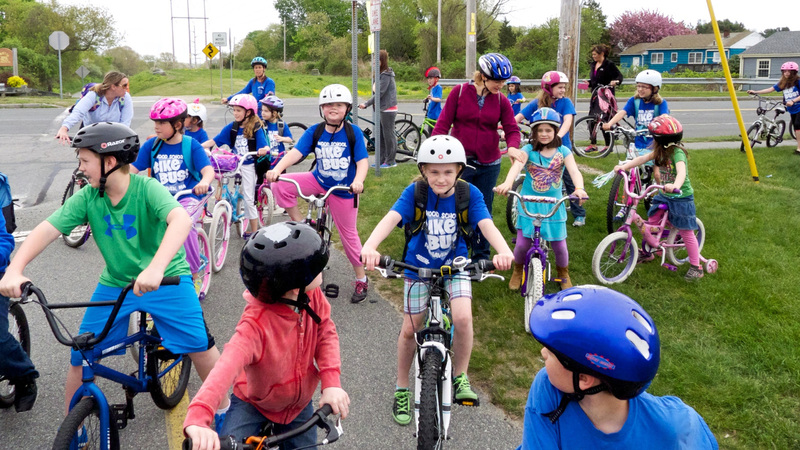 2 Massachusetts State Law requires children under 16 to wear a bicycle helmet. All of our riders, therefore, will be required to wear a CPSC or Snell certified bicycle helmet or Dual-certified skate/bike helmet. Bike locks are recommended, and are not supplied. Wood School has two bike rack areas: on the South side near the bus drop off, and at the Northeast corner near the playground. These racks are not monitored by the Wood School Staff. Be sure your child knows how to operate their key or combination and has a safe place to keep it.